Which neighbourhood fits your personality? Your home is the most important investment you will ever make, and choosing the right neighbourhood is a crucial first step. Midtown Toronto is home to some of the safest, prettiest, and most sought-after districts in the city, but which one is right for you? Minimizing the amount of time you spend getting to and from work gives your quality of life a major boost. Toronto’s midtown neighbourhoods generally make for quick commutes to the downtown core, but you should still perform precise calculations to figure out how long your daily travel time will be. 2. What does the neighbourhood transportation infrastructure look like? The proximity of public transportation and major driving routes has a strong influence on your commute time and other travel commitments. Sure, that leafy cul-de-sac might have a charming home on the market, but if it’s a 30-minute walk to the nearest subway station and exits onto a heavily congested two-lane surface street, it might also create some headaches you’d rather avoid. 3. Can you walk to local shops, services and amenities? Homebuyers are increasingly prioritizing walkability as a major consideration. This is partially because people are more aware than ever about the environmental impacts of their transportation choices, and also because strong walkability factors tend to support higher resale values. If you’re within walking distance of all the stores, amenities, and services you’ll need on a daily basis, life will also be much easier and more convenient. Look into the walk score and ask your agent for insights into the area's walkability. HoodQ produces a quick and easy summary, many top agents have access to their reports. Parks, green spaces, and indoor and outdoor recreation options brighten neighbourhoods and help family members enjoy active lifestyles. 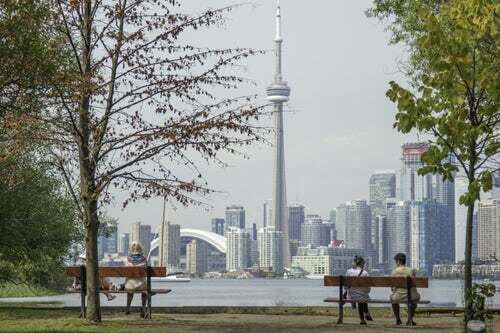 Toronto can feel like an urban jungle, and having a quiet, leafy neighbourhood park or nature preserve where you can relax and unwind helps improve your peace of mind. There are some many parks and ravines in Toronto, your chosen neighbourhood is bound to have one close by. If they are important to you, be sure to ask your agent. Dog owners should inquire about the local off-leash areas and dog parks. If you’ve got school-age children, you’ll want to make sure the area you’re considering features highly rated public schools within walking distance of your new home. The midtown Toronto area also houses many of the city’s most prestigious private schools, and if your kids attend, it will make their lives easier if you limit your search to proximate neighbourhoods. Neighbourhoods with good schools also see higher home values. The Fraser Institute ranks most Toronto schools and the TDSB's website will show you the catchment boundaries. 6. Do you like peace and quite or the hustle and bustle? Street noise should be a consideration. If you’re sensitive to noise, you should also scope out the streets you’re considering at different times to get a sense of how much activity goes on. Busy streets with lots of pedestrian and vehicular traffic contribute to higher noise profiles. Schools and popular businesses also tend to attract a lot of traffic, which sometimes concern parents with young children. Midtown Toronto real estate generally enjoys strong growth that typically outpaces the city’s overall appreciation rates. However, some areas historically perform better than others. Talking to an experienced agent who specializes in midtown properties (aka Jethro Seymour) will help you navigate your options if you want to maximize your investment potential. Visit our annual neighbourhood sale statistic pages for insights into the numbers and historical home values. Last but not least: where do you want to live? Have you always dreamed of owning a beautiful home in a prestigious neighbourhood like Forest Hill, Yorkville or Rosedale? Do you want to live in a hip, trendy area or a neighbourhood with refined, historic character? Midtown Toronto offers these and many other options, and there’s an excellent match waiting no matter what kind of vibe you’re looking for. Jethro Seymour, one of the Top Real Estate agents, is a midtown Toronto residential specialist with over 20 years of sales experience in real estate, marketing, construction and publishing. He has helped many families, friends and investors find homes in Toronto’s great neighbourhoods and has extensive knowledge of local markets, new home construction, resale home sales, and the condo market. Living in midtown Toronto, Jethro previews many of the homes that come to market for his clients and inventory knowledge. Jethro specializes in Midtown, Davisville Village and Leaside neighbourhoods. For more information, call Jethro Seymour, Broker. Looking for Homes for sale Midtown Toronto? Contact Me!